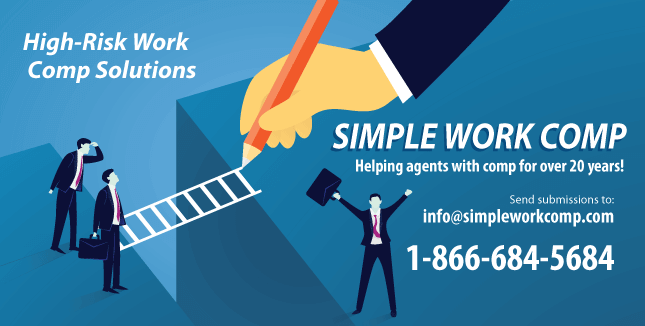 For over twenty years Simple Work Comp has been helping insurance agents retain their hard-to-place risk clients with our successful High-Risk Work Comp Solutions Program. While not every account can be saved, there is a high chance of us turning your unwritable risk clients into long-term money makers without ever having to break a sweat. The process is simple, contact us with a submission, answer a couple of questions and we’ll find you an affordable option to take back to your hard-to-place risk client. We’ll do all the work. In the end, your clients will have the coverage to continue running their operations and you as the agent on record will receive monthly commissions on what would have been lost clients. So, if you’re at risk of losing your clients to the over inflated state pool or another agent who’s selling them pipe dreams; you literally have nothing more to loose and everything to gain by contacting Simple Work Comp. Our sole goal is to find and affordable work comp solutions for you to retain your clients.